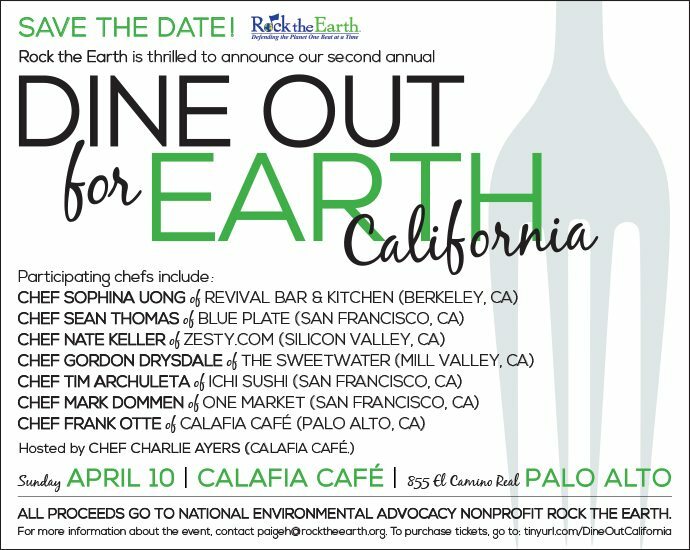 With the gracious and continued support of Chef Charlie Ayers, Rock the Earth will hold a second annual Dine Out for Earth California event at Calafia Cafe in Northern California. Chef Charlie will serve as the culinary curator and has recruited seven of the region’s top chefs to participate on April 10: Chef Tim Archuleta, Chef Mark Dommen, Chef Gordon Drysdale, Chef Nate Keller, Chef Frank Otte, Chef Sean Thomas and Chef Sophina Uong. All proceeds from the event support Rock the Earth. Seating is limited, so get your tickets now. To purchase tickets, click here.